Excited for the Netflix premiere of Dumplin' starring Jennifer Aniston and Danielle MacDonald? Did you know the movie was based on the Young Adult novel also titled Dumplin’ by Julie Murphy? Of course you did, you smartie! While we wait for the movie, here are some other YA titles showcasing beautiful, strong, and unapologetically fat characters. Orphaned at a young age, Faith Herbert – a psionically gifted "psiot" discovered by the Harbinger Foundation – has always aspired to greatness. But now this once ordinary teenager is taking control of her destiny and becoming the hard-hitting hero she's always known she can be—complete with a mild-mannered secret identity, unsuspecting colleagues, and a day job as a reporter that routinely throws her into harm’s way! Well, at least she thought it would. When she's not typing up listicles about cat videos, Faith makes a secret transformation to patrol the night as the City of Angels' own leading superhero—the sky-soaring Zephyr! Sixteen-year-old Gabi Hernandez chronicles her senior year in high school as she copes with her friend Cindy's pregnancy, friend Sebastian's coming out, her father's meth habit, her own cravings for food and cute boys, and especially, the poetry that helps forge her identity. Winner of the 2015 William A Morris Award for a Debut YA Novel! Veronica Walsh is 15, fashion-minded, fat, and friendless. Her summer job in the Consignment Corner section (Employees Only!) of a vintage clothing store is a dream come true. Veronica spends her days separating the one-of-a-kind gem garments from the Dollar-a-Pound duds, without having to deal with people. When two outrageous yet charismatic salesgirls befriend her and urge her to spy on and follow the mysterious and awkward stock boy Veronica has nicknamed the Nail, Veronica’s summer takes a turn for the weird. Suddenly, what began as a prank turns into something else entirely. Veronica may have to come out of hiding and follow something even riskier for the first time: her heart. Already read these and looking for more titles? Check out this list of Dumplin’ Read-Alikes to get your fix! 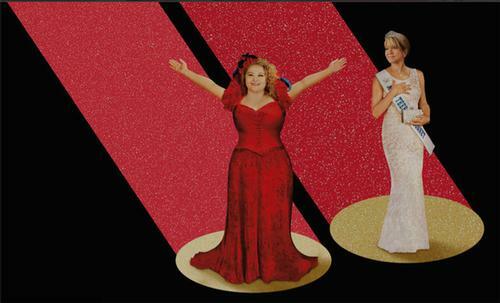 The adaptation of Dumplin' will premeire on Netflix on December 7.